How do I fix the GPG error “NO_PUBKEY”? I know I can fix it using apt-key in a terminal, according to the official Ubuntu documentation. But I would have liked to do it graphically. Is there a way to do this without using a terminal? By far the simplest way to handle this now is with Y-PPA-Manager (which now integrates the launchpad-getkeys script with a graphical interface). Run y-ppa-manager (i.e. type y-ppa-manager then press enter key). 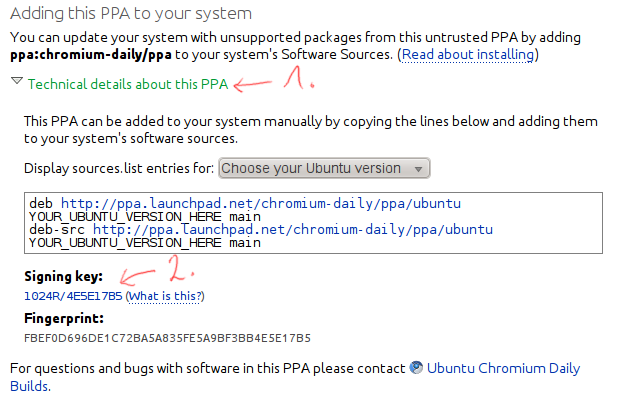 When the main y-ppa-manager window appears, click on "Advanced." From the list of advanced tasks, select "Try to import all missing GPG keys" and click OK.
You're done! As the warning dialog says when you start the operation, it may take quite a while (about 2 minutes for me) depending on how many PPA's you have and the speed of your connection. where <PUBKEY> is your missing public key for repository, e.g. 8BAF9A6F. Note that when you import a key like this using apt-key you are telling the system that you trust the key you're importing to sign software your system will be using. Do not do this unless you're sure the key is really the key of the package distributor. which adds the key to apt trusted keys. The solution can be found here & here & here. You need to get and import the key. Save the page, this is your key file. Select the saved key file and click on OK.
apt can only handle 40 keys in /etc/apt/trusted.gpg.d . 41 keys and you will get the GPG error "no public key found" even if you go through all the steps to add the missing key(s). There is a tiny script packaged in the WebUpd8 PPA which I'll link as a single .deb download so you don't have to add the whole PPA - which automatically imports all missing GPG keys. Such a text is for example displayed on http://deb.opera.com. Copy the passage, paste it in an empty file that you create on your desktop. This results in the key file. Select the saved key file and click on 'Ok'. You may now remove the previously created key file. Good! I finaly found the way! I've tested all method's to fix GPG error NO_PUBKEY and nothing working for me. run sudo apt-get update again and finaly all work great now! Tanks! I had the same problem with DynDNS's Updater client. Turns out it was just expired keys. Reinstalling the software (downloading a new .deb from the website, then using Software Centre to reinstall) fixed the problem. Not the answer you're looking for? Browse other questions tagged apt gnupg or ask your own question. How to fix W: GPG error:… NO_PUBKEY?